← Blu-Ray News #177: Sangaree (1953) In 3-D.
How Could Things Get Any Dumber Around Here? The world’s a real mess these days. So it seems like the perfect time to take a deep dive into the Bowery Boys. They took lowbrow to new heights. And Warner Archive has these cheap things looking like a million bucks. Watch for the first post of hopefully many, coming soon. This is something I’ve been threatening to do for some time. As a youngster I enjoyed watching the Bowery Boys on Channel 5 WMC-TV’s afternoon kid’s show LOONEY ZOO. It was great fun watching the Boys, whether they were lowbrow, or not. I look forward to more posts. I enjoyed some of these kiddos in both They Made Me a Criminal and City Streets! Their early pictures were quite good, some even great. Dead End has the distinction of starring both Humphrey Bogart and Joel McCrea! How do you top that? Local TV in the mid-1960s played THE EAST SIDE KIDS and THE BOWERY BOYS relentlessly. I always liked them best as THE BOWERY BOYS. As a kid I always thought how great it would be to grow up as either Chuck or Butch. Whitey was a little too dumb and had to deal with some interaction with Sach and Slip, but Chuck and Butch had it made. They got to belong to a great gang and never really had too much to do. They just hung around and had lines like “Ok” and “Right” or no lines at all. The most difficult thing they had to remember was the difference between Routine 5 and Routine 7, which always seemed to be the same anyway. What a life, what a career goal…and all those malts on credit!!! Where did I go wrong? One summer our local theatre had the boys on the big screen on weekends, along with westerns and cartoons. I never thought they were very good, but I always found them comforting. H’m. 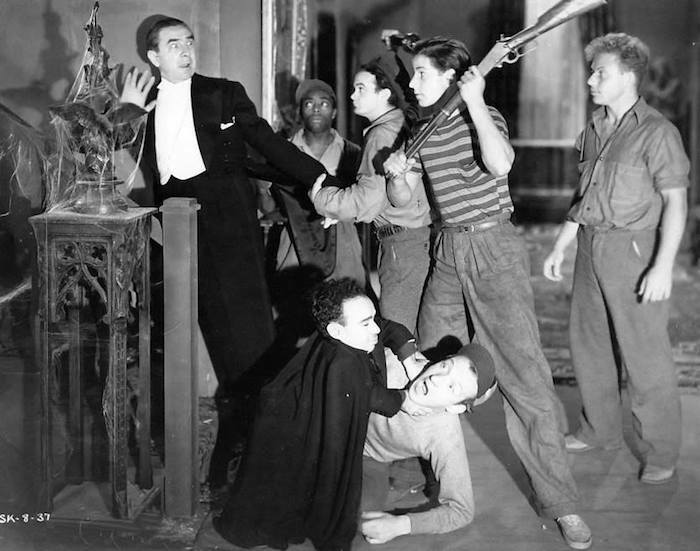 The BOWERY BOYS movies were simply fun guilty pleasures that did no harm. Believe it, or not, sometimes one would stand out above the rest. Check out GHOST CHASERS(1951) with Lloyd Corrigan as Edgar Alden Franklin Smith a 300 year old Pilgrim ghost who talks to us, the audience, as well as through his medium Sach(Huntz Hall). I think non fans will find themselves laughing at this one.